First of all.... WOW !! 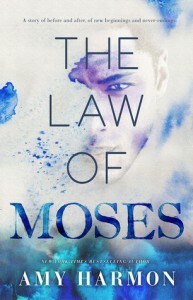 This story is about Georgia & Moses, two entirely different personalities yet a strong bond among them. Georgia is a blonde Cowgirl, lively, funny, stubborn and having a great love of horses. Moses is a cracked baby abandoned in a laundry basket and a mesmerizing artist who expresses his thoughts through his paintings. But he has a "SECRET". A secret that makes him different from all others, that makes him the way he is. I don't prefer adding anymore spoilers. Just to let you know it was a great book, it can be classified in the Paranormal genre as well. Thou shall read it. Yet Georgia falls for him. For that cracked baby, that lonely, strange, messed up man he's turned into. I really sobbed a number of times while reading this book. It touched my heart, as simple as that. One of the great thing about this book was its Prologue. When I was almost at the end, I went back to the prologue and read it again. That prologue had given me a whole different way of guessing the ending but of course it didn't end that way. ! It was truly commendable. I love Amy Harmon's style of writing. You must read it to find it out yourself ! This story is full of emotions, sadness, feelings and how Fate plays it role in our lives. !